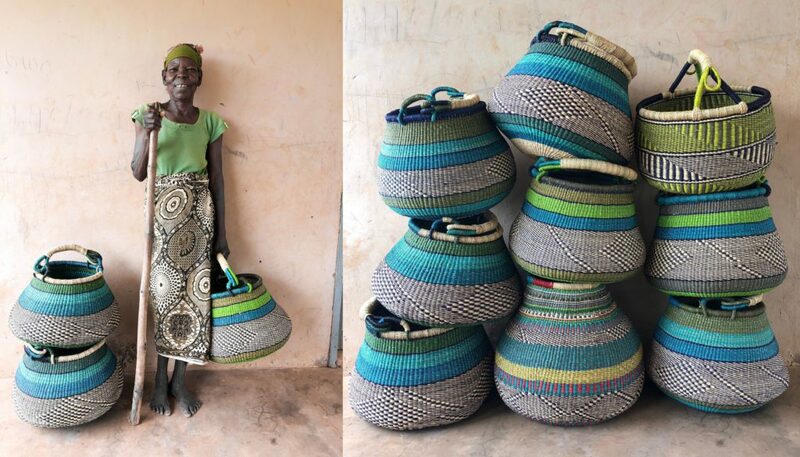 This month we are raising funds to support artisans like Alebipoorum (pictured below) who made your favorite African Baskets in Bolgatanga, Ghana! [UPDATE!] So far our community has raised $1,700 by 114 backers! This is 107.9% of $1,575 flexible goal. Flexible goal means that if we raise more funds than our goal, every extra dollar raised will go to the same community. Next goal for February: $2,100! Go to your Artisan Box subscription settings to contribute! Only 5 Days Left! Alebipoorum with the baskets she made in Bolgatanga, Ghana. As a reminder, the Artisan Fund is a pool of money that is used for community investments—100% of the donations will go directly to the community. Every Artisan Fund will go towards a predetermined artisan group and we will collaborate with them to decide how the money will be best spent. The problem: unsafe working conditions in Bolgatanga, Ghana. This February, we invite you to contribute to the basket weaving artisan group community that makes your favorite African Market Baskets in Bolgatanga. Currently, many basket weaver groups use their personal cooking pots for dyeing the straws for the Bolga baskets. (See the video below). There has been little scientific research regarding whether the dyes, which are imported from other countries, cause direct health effects, but our Bolgatanga partner said it’s highly possible that there are negative indirect health issues. Although there has been little scientific research done on health effects, we believe that health precautions should be taken seriously for all artisans. Together, we have decided that this month’s funds will go towards getting large, communal dyeing pots for preventative purposes. The solution: Artisans currently use a small size 1 or 2 pot (height = 11″, width = 8″) to dye their straw, but the funds will go towards buying bigger size 4 pots (height=25″, width 37″). Each artisan group will get a set of 3 cast aluminum pots where they can collectively dye the straw together. The small pots currently used by artisans for dyeing the straw. GlobeIn works with 10 artisan groups out of 35 artisan groups, and each artisan group has about 15-25 weavers. We know our customers love the baskets, and we hope to continue growing and working with more of the artisan groups! Why did we choose this project? Buying large pots for artisans might not sound as exciting as building wells or giving away free t-shirts, but it actually is much more impactful for this specific group. It is also important to remember that we as a company and fund distributors should never be the sole decision makers on how exactly the funds are distributed and which projects they support. Rather – as it should be with any donations you give or charities you support – the beneficiaries should always be consulted with and have a say on how to spend the money they are being given. Even if it is yours or mine hard earned money. No one knows better than the artisans themselves what they need the most. How can you contribute? Subscribers can contribute to the fund during the add-on period (1st-10th). Just login to your subscription settings right here! What is the goal for February? $1,575 goal but we hope to get more for the rest of the artisan groups too! Will there be transparency about where the money is going? Once the goal is reached, we’ll keep you updated every step of the way and let you know exactly how the money is getting spent. Why are you creating the Artisan Fund? We believe in creating tools of empowerment and wellbeing as well as collaborating with the artisans to learn what needs we can help with. Can non-subscribers contribute? We’re so happy that you asked! Our first iteration is only for subscribers but if we see that others want to contribute as well, we’ll definitely think of a solution to allow non-subscribers to contribute as well! Email us at support@globein.com to let us know your thoughts about the Artisan Fund. 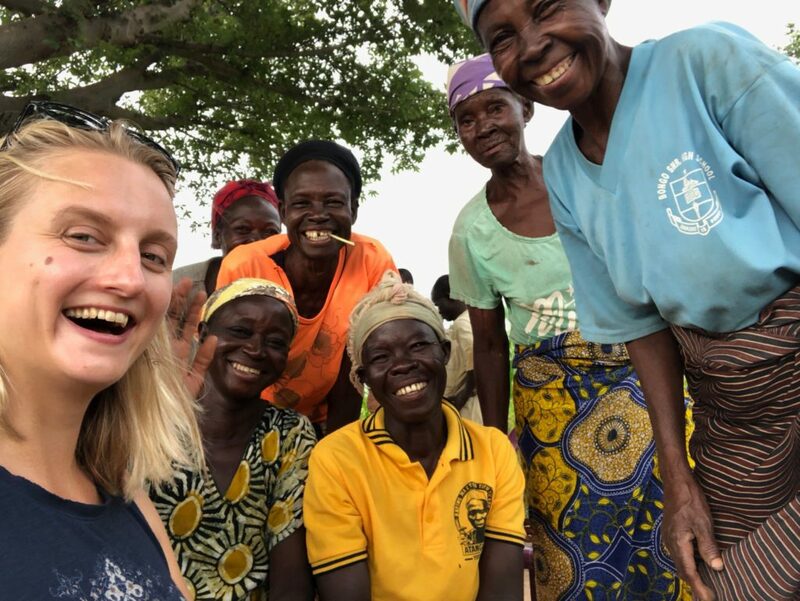 Liza, GlobeIn Co-Founder, with the basket weavers in Bolgatanga this August.